In June for a couple of days there were 8 of us staying in our two bedroom Austin apartment. We were spread all over from our closet, to an air mattress on our kitchen floor. It was tight, cozy, and felt like Thailand where 10 people can live in a tiny house and having a lot of living space isn’t that big of a deal like it is in America. It was our crew, and Dom’s mom, his sister Oi, and Dom’s Thai friend, Yok who was visiting and is working as a chef in New Orleans. There were lots of cooks in the kitchen with Yok, me, and Oi working together to make Thai meals each day for all 8 of us. One night Oi and I made these Tom Yum baked chicken wings, and helped Yok make a Thai soup and a Thai pork dish. We all gathered at our tiny table, and it felt for a moment like I was back in Bangkok eating family-style at a Thai restaurant with so many Thai people eating Thai food together in our Austin home. All the food filled my tastebuds with joy, but Yok said our baked Tom Yum wings were the best thing on the table. I loved all the dishes, but the Tom Yum Baked Wings were definitely the easiest and most kid-friendly dish of the night! 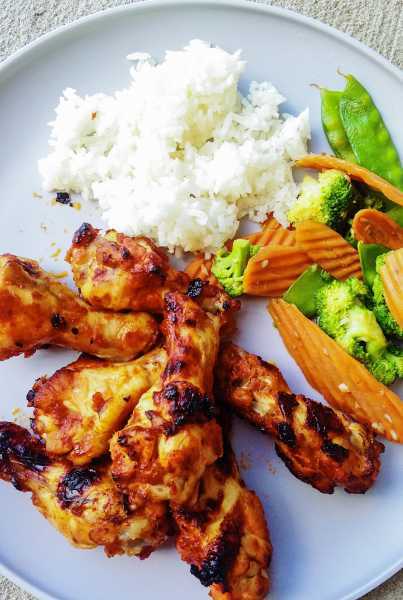 My half-Thai toddlers adore these wings! My 2.5 year old always gets every bit of meat off the bone and then promptly asks for more. Plus, I adore how even though the wings are baked, they come out crispy from being broiled, so it’s like they were fried, but not! Only 4 ingredients, and all you have to do is a quick marinate, broil and you are done! 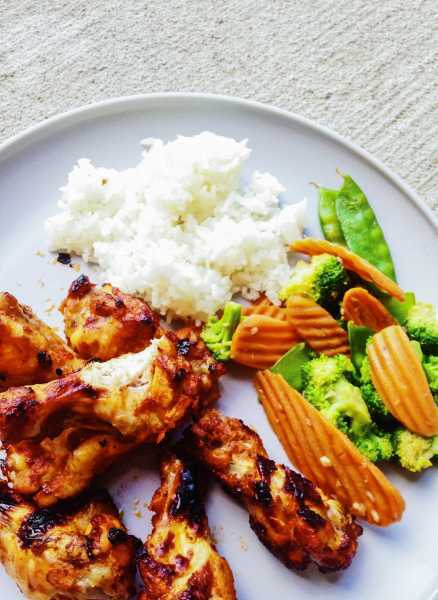 Quick Thai weeknight meal that toddlers love? Can’t get much better! Try it today, and make some sweet family food memories! Easy Thai weeknight meal that is toddler friendly?! 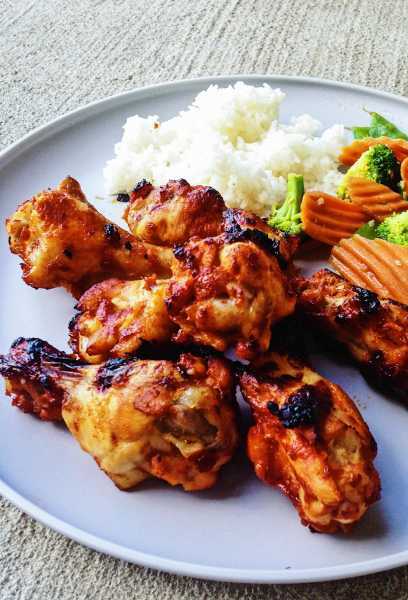 Can't get much better than 4 ingredient tom yum baked chicken wings! Mix the pastes and ketchup together in a large bowl. Add the chicken, and marinate for about 30 minutes. Broil for 12 minutes on a broiler pan. Then flip the chicken over and broil another 12 minutes. Sprinkle cilantro on top, and enjoy with jasmine rice, and other Thai side dishes like Thai stir-fried veggies! If you are lucky, you might find a Tom Yum paste and Sambal Oelek at your normal grocery store in the International aisle like I did! Or get it at your local Asian store, or of course Amazon.